Every now and then, I get an urge for junk food. Vegetables are all very well, but there’s nothing like the occasional meal of that consists of what I’d normally consider to be complete rubbish. I think of this as a cathartic palate cleanser, and it strikes about once a year. Normally, it’s fried chicken, and I’ll find myself in some motorway service station somewhere at night, in the rain, on the way back from somewhere far away, wolfing down some chicken, riddled with guilt. Once it’s done, it’s done, and there’s no need to go back there for many months. 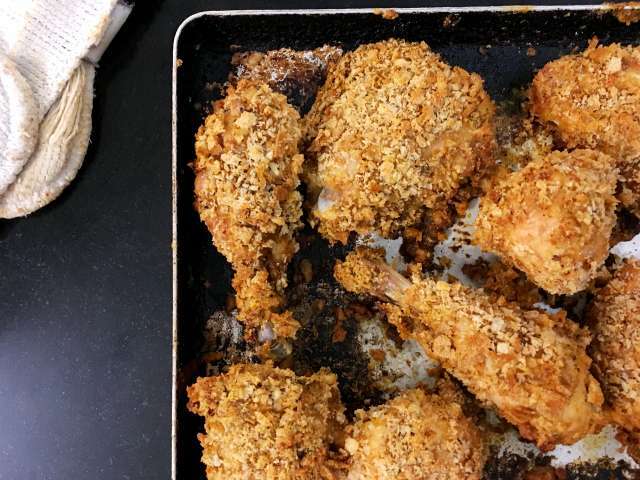 Now, it’s perfectly possible to make a superior version of this awful, awful but oh-so-good fried chicken at home, and I’ll show you how to do exactly that right here, but the High Street, utter junk version is something else. It’s really to do with pressure frying, which leaves chicken crisp and hot, retaining a lot of the moisture that would normally be lost during a more extended cooking process. That, and that infuriating secret blend of herbs and spices that seems to revolve around lots of salt. Before you judge me completely, I keep this whole thing at bay. I look after myself, and chicken shack fried chicken most definitely doesn’t have a place in a good, balanced diet, but every now and again, it should appear, because, well, moderation and experience are both important things. Significantly healthier, equally tasty, but different. First, the chicken. Good quality chicken matters, and upgrading your bird of choice from those regular ‘two for a fiver’ ones to a free range version is a good investment, just be sure to use the whole bird – nothing should go in the bin. That carcass is stock waiting to happen. 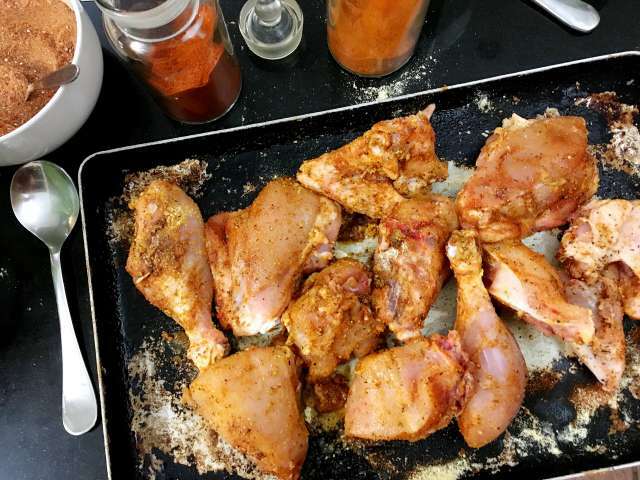 Joint a chicken into twelve serving pieces – remove the legs and divide them into drumsticks and thighs, take off the wings, then chop the back away from the breast, cutting the crown in two through the bone. Each breast is chopped into three pieces. Remove the skin and add it to the carcass for stock. Cook the chicken in two stages. For the first stage, dredge the chicken pieces in a mixture of cornmeal and Cajun seasoning, about a tablespoon of each, along with a couple of crushed garlic cloves and a big glug of olive oil. Rub and massage the seasoning into the chicken and put it into the oven to roast at 190c for twenty minutes. As the chicken cooks, process about 150g of stale bread in a food processor into fine breadcrumbs. I’ve started to save the ends of loaves for this purpose … I dry them out for a couple of days then store them in a Kilner jar until needed. One less thing in the bin. Season the breadcrumbs, add another two cloves of crushed garlic, and tip the lot into a large, shallow tray or roasting dish. When the chicken has had its twenty minutes, take it out of the oven and carefully brush it with a paste made from two tablespoons of plain flour and about double that amount of water. The idea is to give the chicken an adhesive coat so that the breadcrumbs stick, but be sure not to dislodge any of the cornmeal and Cajun crust. With a pair of kitchen tongs, press a piece of chicken down into the breadcrumbs so that it’s fully coated, and return it to the tray. Repeat until the whole lot is breadcrumbed, then splash over some olive oil and return to the oven for another forty minutes. The staged cooking method means that the chicken is blessed with two very distinct crunchy layers. The base layer is highly spiced, and the cornmeal pleasantly rough, the top layer crisp and crackling. recipes. He calls it Jamie’s Fried Chicken, or JFC, which is frankly a bit crap, so ignore that and just think of it as a seriously upgraded, far superior version of the humble High Street fried chicken. Do not serve this in any kind of bucket.